The adventures of a knit designer, her dog, and yarn stash. I'm the author of Doggie Knits, Sweaters and Accessories for Your Best Friend. I had these big plans to have some patterns or kits available for the shows I have coming up. If any of you were looking forward to them, I'm sorry to disappoint you. Here's the thing--there's just too much. I have a full time job for expenses (and Lucky Penny still costs more than she makes! ), and a Man and Piccolo to keep happy. Which sometimes means packing up and heading north, instead of staying home and working on stuff. I have two custom orders working now, and Streeterville wants more sweaters. So there it is. I just have to relax. I showed the Man the galley pages of Doggie Knits. "Who are all these people? ", he asked when he saw my acknowledgements page. A lot of them are the owners of the dogs who modeled for the book. It looks like all of them are in there except for two. I was going over the pages today, changing some captions. I called my editor about an art element that's used, that I would like to see replaced by photos of cute dogs in sweaters. You can't have enough of those, in my opinion, and I think it's what people want to see. The chosen element, while it works and looks nice, just seems so generic to me. My editor, it turns out, agrees, and she lost the battle with the art department. So, there it is. It's amazing that my raw elements and photos could have been put together to make this thing, but part of me thinks that there's not enough of my flavor in the book. I guess I'm just going to have to count on the designs themselves being my influence. In a fit of self promotion, I uploaded Doggie Knits as a project shared with some dog based groups on Ravelry. It could either be taken as, of course I would want these people to know that the book is going to be out there, this is the target audience. On the other hand, it does leave one exposed for being eviscerated. The Man asked if there was going to be a book tour. I outlined about a five mile radius for the tour that encompassed all the LYS I frequent. In a perfect world, I would love to go to San Francisco, because the book has so many ties there, and to Denver, so I have an excuse to see family. I can dream. 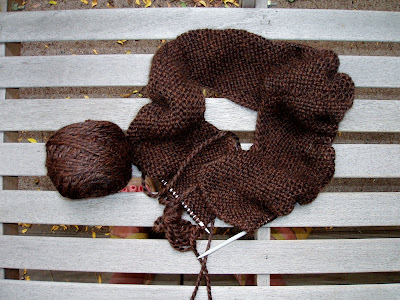 The project on the needles is Juliet from Zephyr Style, in Misti Alpaca Chunky. I had to go down to size 8 needles for this one. I originally was going to do some sleeves on it, but then changed my mind. I think the friction between my arms and body would make for some horrible pilling. But, I'm having to do alterations. For one, working the fronts and back separately for a bit to create deeper armholes. I would travel more than five miles to be your book tour groupie! I am the designer for Lucky Penny Hand Made, named for my dog, Penny. I live in Chicago with an adorable dog named Madeline, a massive yarn stash, and a growing fabric stash. like Lucky Penny Hand Made on Facebook!